Allow me to share a little about myself and tell you more about my company, Cheese to You, and the services I provide. Can Cheese Change Your Life? Yes. It did for me, anyway, the moment I met Chef John Folse of Bittersweet Plantation Dairy in Louisiana. I was working at a wine bar named Vino!Vino!, located in the French Quarter. One day he brought in a basket of hand-made cheeses. This “eureka!” moment came after I’d spent years refining my understanding of food and wine. My education began after completing my B.A. from Eckerd College in Florida. I moved to New Orleans and worked at Susan Spicer’s Bayona. Vino!Vino! was the off-shoot of this prestigious restaurant. I learned quite a bit those years. When cheese captured my fascination I knew I’d found my calling. In 2001 I opened my own restaurant. The cheese menu featured a variety of cheeses, but American artisan cheeses predominated. Following my husband’s career, I closed the restaurant and moved to Lexington, Virginia in 2005. I initiated three restaurant cheese programs prior to launching “Cheese to You”. Be warned: my passion for artisan cheese might be contagious! My parents became interested in artisan cheese, too, and spent the beginning of their retirement researching and writing a book on the subject. 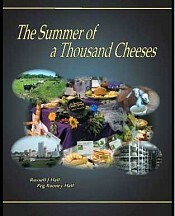 The resulting book is “The Summer of a Thousand Cheeses”, which, naturally, I highly recommend. Please join the Cheese To You mailing list so you’re notified about the latest cheese arrivals and special events. I look forward to meeting you in person. Visit my shop at 32 S. Main St, Lexington, VA. Hours: Tuesday- Saturday 11:00-5:00. Please call (540)3 319-8107 or email mycheesetoyou@yahoo.com.